Ormonde Castle Manor House in Ireland was built by Thomas, the 10th Earl of Ormonde, who was also known as “Black Tom” Butler. He finished the structure in 1560 while his cousin, Queen Elizabeth I was in power. Tom included all the queen's favorite symbols and workmanship in the manor, but sadly, Elizabeth never came to visit. 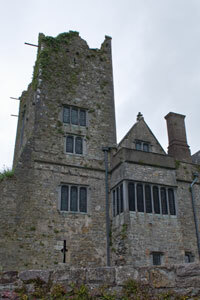 Ormonde Castle is part tower house with a built-on Manor House. The original castle was built in 1309 and fell into ruin. 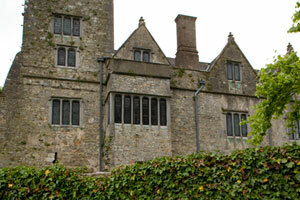 You can see how two of the four original Irish castle towers are incorporated in the tudor manor house. 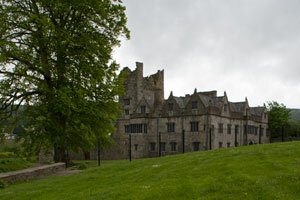 The castle is Ireland’s only major unfortified dwelling from the 16th century. The murder holes and guardrooms were not included in the manor house plans, as defense was replaced by style. Mural paintings of Black Tom and Queen Elizabeth I hang in the entry courtyard of the Castle in Carrick-on-Suir, Ireland. There are also many historical documents on display. The state rooms in the manor House contain fine decorative plasterwork, including plasterwork portraits. The nicest feature of this Irish castle is the 60 foot long gallery on the first floor. It is a light and airy hallway with beautiful woodwork. The plasterwork has been renewed and the room has two chimney pieces. The ceiling is stucco and sections show various heraldic symbols. Ormonde Castle is located in Carrick-on-Suir in the Southeast region of Ireland. If you get a chance to visit the castle, stop by the village and see the fine 15th century stone bridge on the west side of town. The seven-arched bridge links south Leinster and east Munster and was built in 1447. 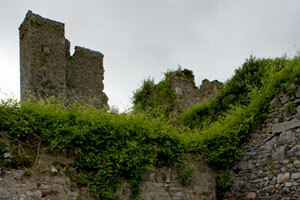 The castle is on N24 as you drive through Carrick-on-Suir. I saw the sign as I was driving from Waterford to Killarney, going west. 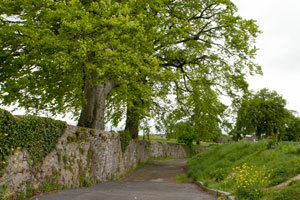 The castle is open to visitors from mid-June to early September. 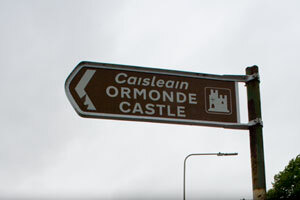 For hours of operation and more information on Ormonde Castle, go the Heritage Ireland website.